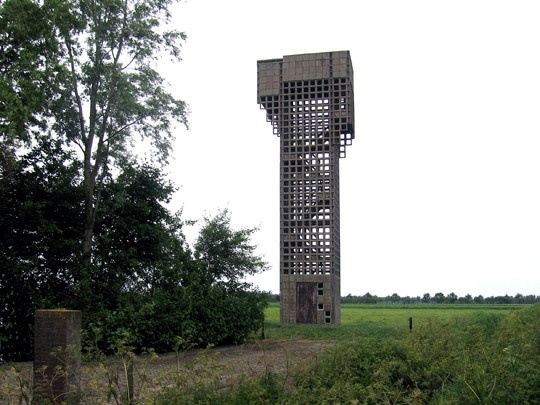 The 1950s saw a total of 130 air defence towers built in the Netherlands. These, combined with existing buildings enlisted for the purpose, formed a network of 276 posts no more than 16 kilometres apart. From them, volunteers from the Dutch civil defence (Bescherming Bevolking) could watch out for hostile aircraft and pass on their sightings to an air defence centre by telephone. The towers were assembled from 38-centimetre precast concrete elements with a honeycomb structure. Their height varied between 2.52 and 31.02 metres. Trees planted around them served as camouflage. Most of the air defence towers have been demolished. The three surviving examples in Zeeuws-Vlaanderen (in Eede, Koewacht and Nieuwnamen) along with a further seven elsewhere in the Netherlands, stand as monuments to the Cold War.